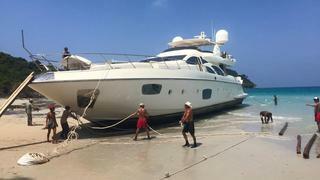 A superyacht belonging to a Russian fugitive has been beached in Cambodia. The yacht, which is reported to be a 98-foot Azimut, belongs to Russian billionaire Sergey Polonsky. Polonsky, who had an estimated wealth of $1.2bn prior to the 2008 financial crisis, is wanted in Russia after being accused of embezzlement. He currently lives on a privately owned island in Cambodia. His superyacht has been stranded for more than a week at Koh Tang, about 50km from Sihanoukville. It is not clear how the luxury yacht came to be beached. Refloating the yacht is not likely to be an easy task as local press have reported that the island has limited machinery and expertise. Polonsky has been charged with fraud in Russia in relation to a property firm that he founded. He is accused of stealing more than $172 million from people who paid upfront for apartments in a block his firm was building. He was first issued with a "red notice" by Interpol in November 2013. Cambodia is currently refusing to extradite Mr Polonsky on the grounds that there is no agreement between the two countries.